Posted by Jon in News, Wild Mammals on Sunday 12/07/2009 13:47 UTC. We take in all kinds of animals, from unwanted hamsters to blind bulls. 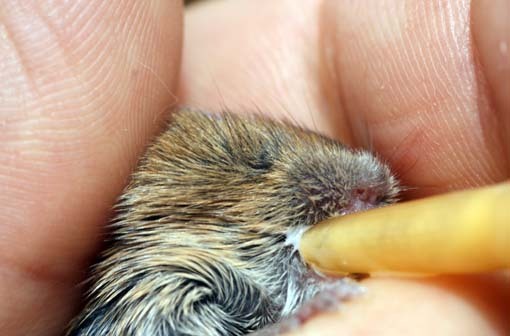 It is the same for wildlife, we hand rear fox cubs, birds, squirrels, hedgehogs and even in this case a baby field mouse, smaller than my thumb! Unfortunately a cat caught two babies and both parents, killing the mother. They were brought to us by the cats owner, we released the father back inot the wild and are now hand rearing the only surviving baby. The other baby died shortly after arrival, it was very cold and had puncture wounds from the cats teeth. Cats mouths are full of bacteria and often cause infections. Hand rearing creatures of this size poses many challenges, particulary at feeding time. 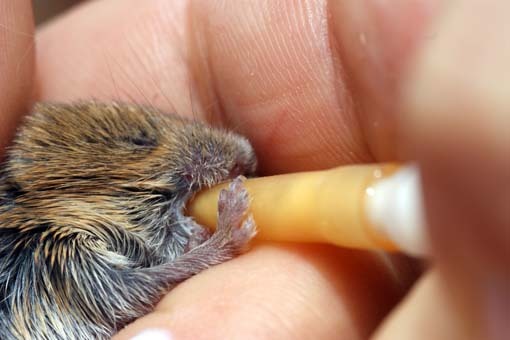 This mouse is being fed from our smallest syringe (1ml) and teat. View more posts in News, Wild Mammals or browse all posts.You can follow this story via its RSS 2.0 feed.